If you’re in a motorhome, and not towing, then you’ve got very little to worry about. Let’s say you have a class A diesel pusher with a GVWR of 40,000 lbs, and it’s dry weight is 35,000 lbs. That means you have 5,000 lbs of weight capacity that you can add to this motorhome in fuel, water, stuff, people, pets, goodies, gizmos, gadgets… you know, ‘stuff’. 🙂 Seems like way more than enough, right?! If we fill up our 100 gallon fuel tank with diesel at 7 lbs/gallon (link), that’s 700 lbs. Now we fill up our 100 gallon freshwater tank, at 8.5 lbs/gallon, that’s 850 lbs. We also need to fill our propane tank, which is 40 gallons, and at 4.2 lbs/gallon that’s 168 lbs. 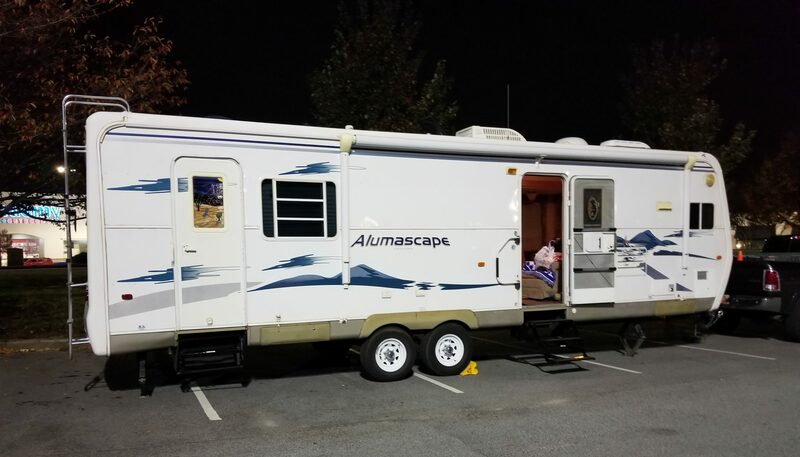 Now we bring aboard our camp chairs and table, our clothes, our food, our canopy, and all the other stuff we want to take with us to make life on the road more comfortable, so let’s say all of that is 2,000 lbs. I know, seems like a lot, but if you start weighing stuff, especially tools and spare parts, you’ll find it all adds up very quickly! Fill up your rig with everything you want and need, then go get a Non Commercial weigh. Once you know what your rig weighs fully loaded, you can see for yourself how much room you have, or how much you need to take off.